I thought it would be nice to dig into my box of graded comics and share the story of how I decided to snag this key issue. If you're a fan of Total Comic Mayhem, you may have already read a version of this story, but I'm going to retell it here anyway. It all started back in 2013 when my friend, and partner in comics, and I went to the inaugural year of Stockton Con at the Stockton Arena. As I entered the arena, I was a little overwhelmed and quite surprised at how many people were there. As I made my way through the celebrity tables and vendor booths, Stockton Con instantly became one of my favorite conventions in the area. My friend and I started to get hungry. We grabbed some food and sat down to eat. The seats at the arena look out over the convention floor, so they're great for people watching. As I was stuffing my face with some nachos and looking out over the people, I saw someone cosplaying as Superman. I then noticed that his face was painted white and a split second later, I realized he wasn't Superman at all, he was dressed as Bizarro. This is the exact moment that this comic shot right to the top of my want list and my quest to find his first appearance started. Finding this comics wasn't easy. There weren't a lot of copies to be found, and the copies that I did find were usually dirt copies. The first copy I found was at a convention. I think it was at Easy Bay Comic Con, but I'm not 100% sure. The vendor had a copy on his wall, but the copy far from any grade I was looking for. The cover on this copy was completely detached but the vendor still wanted $200 for it. I politely passed on it and handed it back. I saw a couple more copies at other conventions, but they were in the same low grade condition as the first one. There were far more options online than there were at the cons and they were in much better condition. Now I had to find one that was in my price range. It took a while but I eventually settled on a decent CGC 5.0 copy from eBay. I had this copy on my watch list while I tried to convince myself to pull the trigger on it. It was the closest to guide price than anything else that was listed. I finally talked myself into it and was ready to buy. I sent a message to the seller and was informed that he just sold the comic and it was no longer available. Needless to say, I was a bit disappointed. 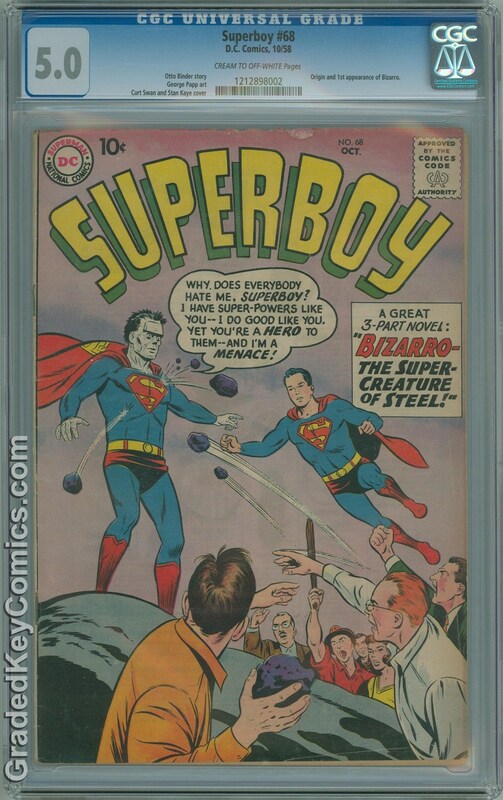 However, not long after that disappointment, another CGC 5.0 copy was listed, but it was priced slightly higher, about 50 bucks, than the last one I was looking at. As I was checking out the pictures, I noticed that it was the same exact copy that I was going to buy the first time, but from a different seller. I immediately threw it on my watch list. As I was checking out what other copies were on eBay, the seller dropped the price down to the same price as the last auction I was originally looking at. It must have been fate. It didn't take me long to decide to buy it. I wasn't going to let this one get away from me again. And, it didn't hurt that there was a 4x eBay Bucks promotion going on. I got $40 to put towards my next comic purchase. Even though prices are slowly starting to rise, I still feel that this is a comic that is overlooked and under valued. 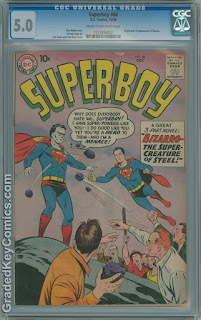 Bizarro is an iconic Superman villain, and this is an early Silver Age book. It seems to me like this comic should go for a lot more than what I paid for it, but you're not gonna hear me complain. I'm just happy to have a copy stashed away in my vault.